Hey everyone! Today I have an art journal page using my Mini Gelli Plates as stamps for a pretty quick and easy background. I started out with two of the new Dylusions paints colors; Peony Blush and Rose Quartz. I applied them with a brayer which is a super-fast way to get your background covered with some interesting color. The brayer adds a nice texture that you just can’t achieve with a paintbrush. After I had the pink colors down, I thought it needed a little more contrast, so I added Dina Wakley Acrylic in Elephant. Elephant is a nice grey color that leans sort of pink-y, so it was a great addition to these pink colors. 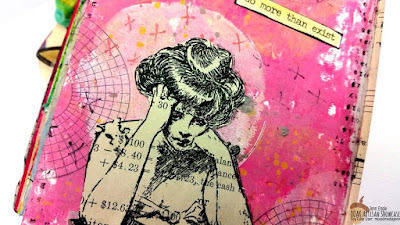 Next, I wanted to use my octagon shaped mini Gelli Plate as a stamp, but I wanted to stamp it as a circle. So, I die cut a circle out of cardstock so I could just lay the negative circle space over my Gelli Plate. Then when I stamped I got that circle shape I wanted. 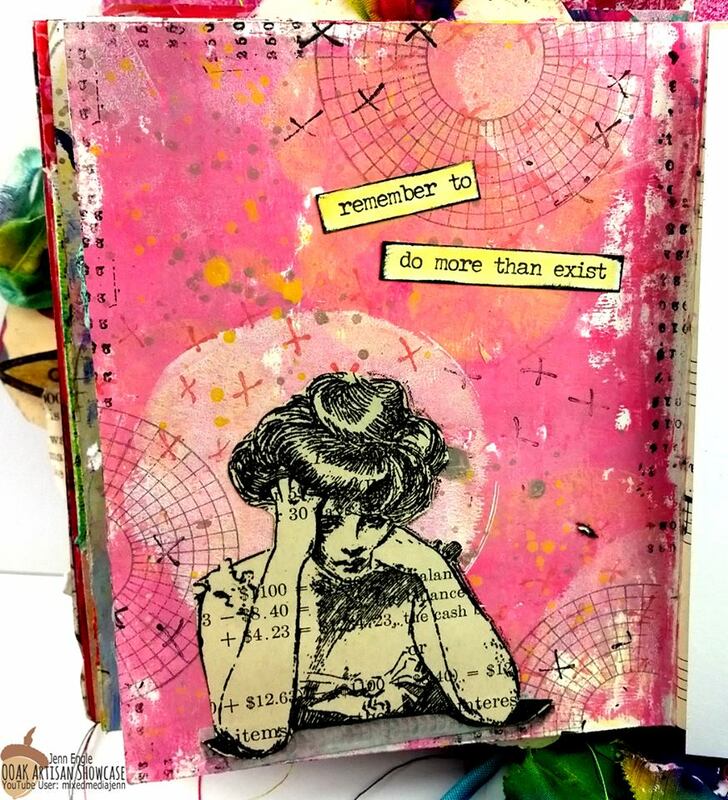 I added Dylusions Paint in Vanilla Custard to my Gelli Plate, then took a small stamp to stamp into the wet paint on my Gelli Plate. Then, covering my Plate with the cardstock circle, I stamped right onto my background. I stamped several times around the page because the paint was wet enough to get several stampings out of the one application of paint. 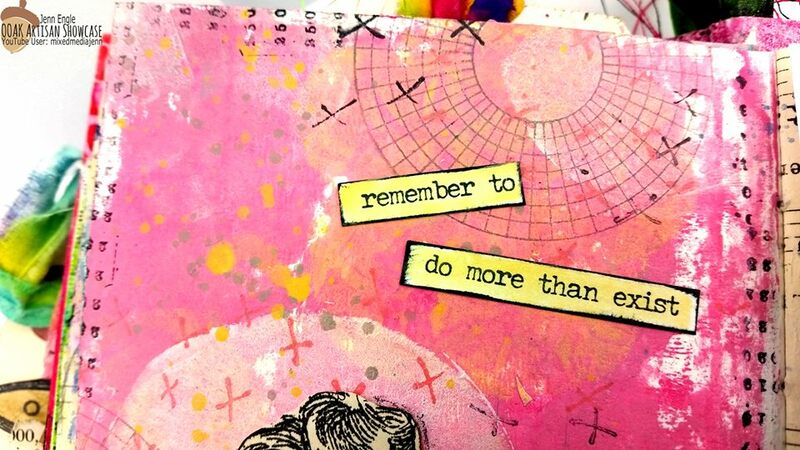 Next, I brayered some white gesso onto my Gelli Plate and just stamped plain circles in 3 areas around my page. I made sure one of the stampings was right behind where I planned on putting my focal image. Just a note, the reason I used white gesso and not white paint is because I use them interchangeably. Gesso is a lot cheaper than white acrylic paint, so I just use gesso for everything. 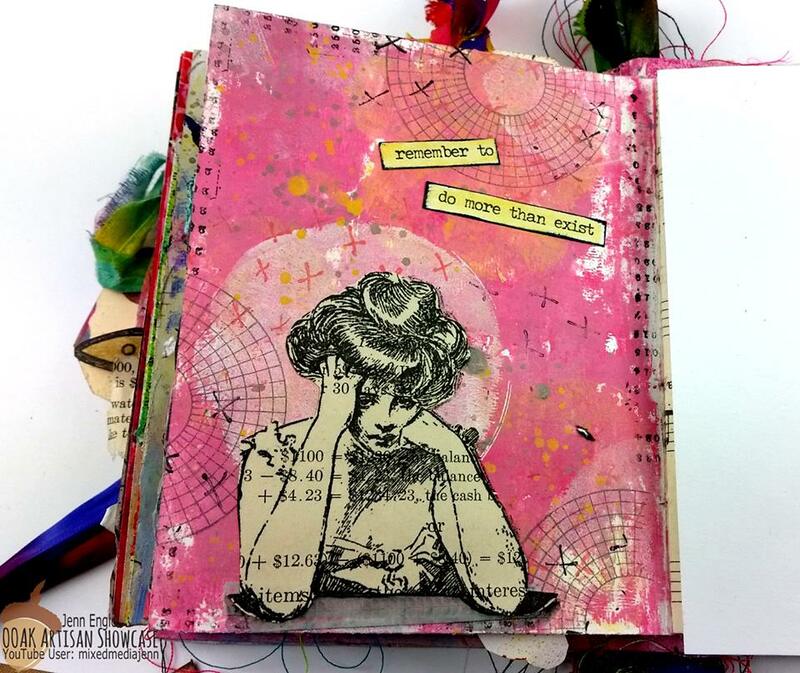 Then, I stamped a stamp called “Fed-Up Lady” by Viva Las VegaStamps onto a vintage book page. 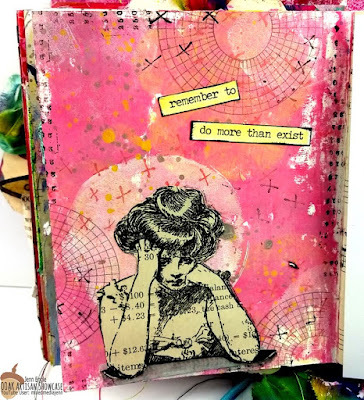 I think stamping on a vintage book page gives a little more interest than just using plain white cardstock, especially when the background is more simple like mine is here. I stamped with VersaMark ink in Black because it is a super dark black ink that shows up great on a darker paper. Next, I got out a bunch of my favorite background stamps from Viva Las VegaStamps and VersaMagic Chalk Ink in Pink Grapefruit, Distress Oxide in Worn Lipstick, and Archival Ink in Watering Can. I just randomly stamped around my background until I was happy with the results. Then, I adhered my fed-up lady to my page with Clear Tacky Glue. For my quote, I used a phrase from the Tim Holtz Chit Chat phrase stickers. I thought it looked too stark white against the background, so I watered down some Vanilla Custard Dylusions Paint and lightly painted over the white of the sticker. Finally, I added some grey and yellow paint splatters all over to bring everything together and that was it! It was a pretty quick page to make, but I was happy with the result! 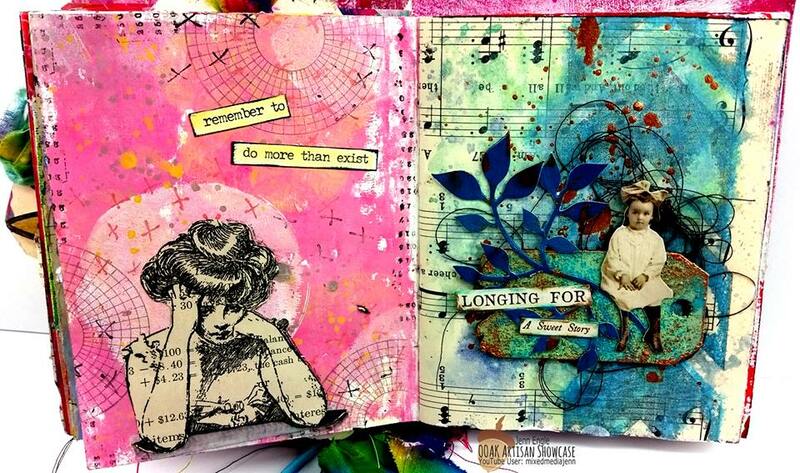 You can see more of Jenn's creations online! OOAK Artisan Showcase is a place where we motivate, encourage and promote other artists. No strings - just New Faces. New Designs. New Art. Got art? Send us your blog, shops and any other online urls you want us to use in promoting your art related news - does NOT have to be a certain medium*. AND if you have something specific you want promoted today, let us know. In the future, send us a message here or by tagging us in your latest work! • If you just create as a hobby you are still CREATING and we want to see! Your work can serve as inspiration to the next artist. • If you create for charities, let us know. We want to do a shoutout! OOAK Artisan Showcase is a PUBLIC forum. SIGN UP for our newsletter to stay updated on all our news, events and sales, CLICK HERE!